Making fun of dis movie be like taunting Grover’s cuzin Edwin, de one who eat candles and walks into walls. Too easy. And where de fun in dat? Well, okay, still some fun – but well below average. 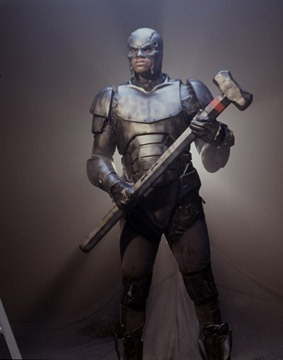 Monster have to admit, aktor Shaquille O’Neil be perfekt choice to play role of Steel. Who better to play lamest superhero in comic book history den one of de worst “aktors” in movie history? 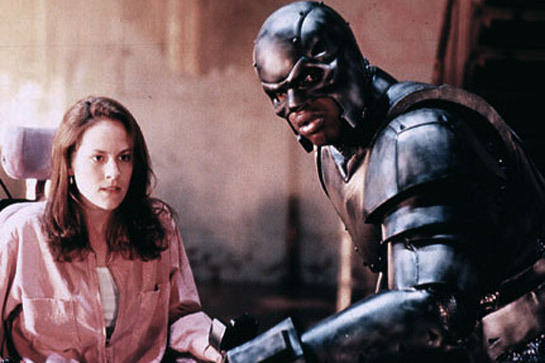 In Steel, Shaq play part of genius weapon designer John Henry Irons. Dis bear repeating. SHAQ play part of a GENIUS. He design weapons for army. Anyway, movie begin wit one of his weapons test gone awry. Ceiling collapse, kill gabby senator and injure Shaq’s friend, Sparky, de girl wit de dog’s name. All de fault of Evil Judd Nelson who try to act tough and get in Shaq’s face – tho dis very hard to do when guy you’re trying to stare down be two feet taller den you. Shaq John Henry quits army and heads back home. Judd goes too. To Bust a Move! While Judd gets job wit arms dealer, Shaq visit his sassy grandma. On ride-along wit his cop sister, Shaq stumble on bank robbery by gang using bazooka lasers. Hey! He recognize dose weapons! Shaq report dis to his commanding officer – who not all dat interested, mirroring general attittod of audience watching dis sad piece of film making. So, Shaq say “F him” and put together his own cliche team: wheelchair-bound Sparky, kid, and old man (who, at one point in movie, aktually use de line: “I’m getting too old for dis!”). A-Teamesque building montage ensue. Dey forge supersuit of steel (dat look suspishushly like hard plastic). Armed wit giant hammer (Not for hitting bad guys. It just a magnet of course!) Shaq John Henry Irons is Ironma Steel! Uh, how much does dis ting weigh? Gang chasing down other gang. Bulletproof Steel show up (luckily, nobody smart enough to shoot him in de face) and give bad guys de old one two: 1) Stop car wit his sonic weapon and cause occupants to fly thru windshield. 2) Deliver cheesy line: ” “You should always buckle up.” He den use electromagnetic lock to take everyone’s weapons. Cops arrive. Steel escapes by jumping between buildings. Jumping between buildings? Exacktly how much dat suit weigh?! He lower himself down side of building and and end up in garbage container. When Sparky contakt to ask him how he doing, he respond: “Just a little trashed”. Ho ho ho. Not only he be a genius; he be a comedy genius! Bad guys triangoolate signal back to his home base. Evil Judd Nelson frame Steel for bank heist. He arrested! But Sparky a computer tech expert (Naturally. She a movie/television charakter in a wheelchair, duh!) and get him released. Steel crash weapons auktion. But evil Judd Nelson has Sparky hostage! Steel tell Judd NOT to use his hammer. Whatever he do, don’t do it! Don’t do it! Don’t flip de red switch! If monster was Evil Judd Nelson, me would say “Okay” and shoot Steel in de face instead. But monster not Evil Judd Nelson. Me just movie reviewer wit average intelligence, not movie villain wit below average smarts. Of course Evil Judd flip de red switch. And electromagnetic lock cause hammer to fly back to Steel. Ha-ha! Who saw DAT coming?! Everyone except Evil Judd Nelson. Sparky have her wheelchair outfitted with machineguns. She shoot up warehouse, den use rocket jets on wheelchair to get away in sequence dat is both surprising and weird and really stoopid. Movie end wit big shootout and Evil Judd Nelson getting killed by lazer dat deflect off Steel’s, uh, steel outfit. 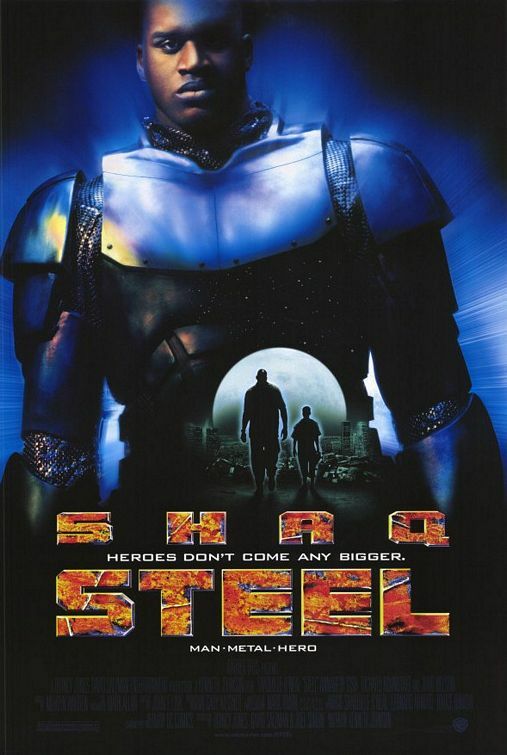 Counting Blue Chips, Kazaam, and now Steel, Shaq hitting 0.00% from de field. Verdikt: Monster want to use Steel’s hammer to beat on whoever greenlit dis movie. Rating: 1 chocolate chippee cookies.